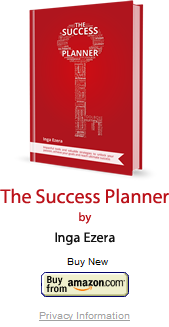 I’m Inga Ezera, your personal brand development partner. I’m passionate about empowering people like you to be a better version of yourself and succeed by being your true you. Its all – through your personal brand development for clarity and personal branding strategies for raising your profile in front of your ideal audience. How do you expect other people to know your greatness if you do not raise your profile? If you just keep it to yourself, you limit the opportunities for you and others. For you – to do more of what excites you and what you are truly passionate about, for others – to get inspired by your passion and benefit from you sharing your knowledge and expertise. If you are either an entrepreneur, a business leader or a professional, raising your profile is a must now. It’s not so much for self promotion purposes, but rather for sharing your vision, purpose, knowledge and expertise, so that people get to know what you are truly great at and can come to you for your core expertise and passion to share it. It is more for taking charge of and creating opportunities in your life to do more of what you are excited about and deliver value for others in a way that you love doing it. For entrepreneurs: you get more clients that are your ideal clients, that know, like, and trust you are the one they need and will find you themselves. You can focus on doing the job that you love, not on running after clients and selling your services to them. For business leaders: you attract your ideal employees as people work for people they resonate with. It’s easier for you to work on business development as you are known in the industry for what and how you do things, and you can better impact and influence decision making for the business and your business stakeholders. For professionals: you can stop doing the boring job and receive more opportunities to do the job that you are excited and passionate about, that has more meaning. We all live just once. If you are well paid now, but not really enjoying what you do, I’ll tell you this – you can get the same or better paid job that you truly enjoy. Just raise your profile in the right way to the right audience. 1. Develop absolute clarity on your personal brand – your talents that you want to apply, your passion, values, your WOW effect, purpose, mission and vision for your life and then compile it into a short and snappy elevator pitch – into a short but impactful introduction, that conveys the message – of who you are, what you do and whom and how you can help. There is a best in you, you just need to be clear yourself – on what it is and bring it up. As an example, I can do many things in business, like I can recruit the best talent from the market, I can implement performance management programs etc, but what I truly and absolutely like best is – helping you to be the best version of yourself, be congruent and enjoy being truthful to yourself and others, raise your profile in accordance to that and enjoy what you do. I am great at inspiring you to think about it, empowering you to take action, equipping you with tools and strategies to do it and challenging you to, just do it! 2. For that, you need to define clearly who is your audience – your customer, employer, stakeholders – for whom exactly you are delivering value and what transformation you help them with. I advise you to be very specific about – who is it that you serve, help, deliver value, as then you can communicate and raise your profile where and in the way that they will see, notice and appreciate. As an example, my audience is people like you – entrepreneurs, business leaders and professionals and corporates who care about their people and want to do something disruptive, innovative and truly empowering for their people. 3. Social media content strategy – you can raise your profile either in 1-to-1 communications, networking – by connecting to 5-10 people per event, or – you can massively raise your profile through thoughtful and purposeful social media content strategy. Your daily, weekly, monthly and quarterly communications, will ensure that your ideal audience will get to better know what you are all about, and how you can serve them and deliver value. Also, what your values and work ethics are and what results you can deliver. As an example: I am crystal clear on my top 3 messages for social media communication and I have a clearly defined social media content plan that is congruent with what I am aiming to achieve. You might have regularly seen my posts, videos, blogs and articles to inspire, and empower you to take action. I hope this is helpful – inspirational, educational and practical. Now – its your time to take action. Let me know if you have any questions and how you are progressing. I’d love to hear about your journey.